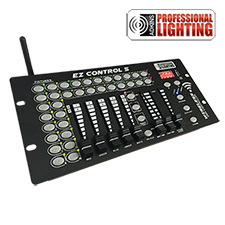 The EZ-Control-5 is a compact DMX or Wireless DMX controller with a built-in 2.4GHZ wireless DMX transmitter. Works great with all Adkins Professional Lighting and Blizzard Lighting wireless lights in 3/4/5-channel modes. Controls up to 16 fixtures of up to 10 channels each. You can easily program up to 16 scenes and 16 chase banks of up to 200 steps each. Programs can be triggered with ease by the beat of the music, automatically or manually. Plus, all chases can be executed at the same time! 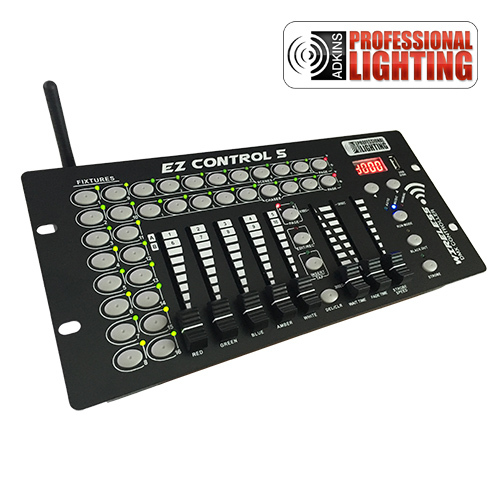 The EZ-Control-5 features five RGBAW universal channel sliders, quick access fixture and scene buttons and an LED display indicator to make for easier navigation of controls and menu functions. This EZ-Control-5 controller features a built-in wireless transmitter provides reliable wireless communication for over 1000 feet, line-of-sight! 512 auto-assigning frequencies in 7 groups (color-coded by an LED indicator) allow up to 7 systems to run simultaneously in the same space, completely free of interference. And rest assured, the frequencies of the EZ-Control-5 match up perfectly with all Adkins Professional Lighting and Blizzard Lighting wireless DMX products EZ-Control-5 also features a good old fashioned hard-wired DMX output!